Dario Nardi recently published a book called Neuroscience of Personality. It contains his insights based on put a 20 sensor EEG on 60 college students of various types, and then having them perform various activities. Since it includes both qualitative and quantitive research results, it's probably not definitive proof of type or type dynamics. Still, I think his approach is interesting and his book helps shed light on how type relates to activity in the neocortex. Helps us decide quickly and quickly, and explain our reasoning. Helps us ignore unwanted, negative ideas and feedback. Consider a new or unpleasant idea. Broadly, tracks whether we are at the beginning, middle, or end of a task. Helps regulate our emotions while processing negative, depressing or disruptive data. Ask "maybe" and "what if"
Mentally play out a situation. Home of the "mirror neurons." Works as a kind of mental holodeck, where we play out scenarios in an imaginative context. Gets active when you say what's important to you in life. Helps guide our speech and recall detail about the things we consider important. Ignores context, so provides cross-contextual beliefs and details. Gets active when we follow a branching logical structure or chain of reasoning towards a conclusion. Requires thinking in words or symbols. Most people who less activity here than in most regions. Categorize a person, place, thing, event or idea. Have a sense for how well a concept fits a particular category. Gets active when we classify and define concepts. For example, is a dolphin a fish or mammal? Like F3, underutilized by most people. Requires domain expertise to build up accurate categories. Attend to proper grammar and word usages. Listen to other people's words. This region handles words, both yours and those spoken by others. It's also used when performing tasks we've learned to do by speaking. If you talk to yourself while doing thinking (solving math problems, etc), you are likely using this region. Some people don't use this region much, but instead may think in symbols, pictures, etc. Feel someone is speaking in a phony or false way bu cannot say why. This region handles tone of voice and other affective qualities of sound and voice. Also home to irritation and hostility. Retrieve a memory that contains specific information such as date or time. Recall a sequence of action steps. Attend to sensations on the right side of your body. This region handles sensations and motor movement of the body's right side. Neurons in this regions are laid out in a way that mimics actual body layout. Activates when recalling factual "textbook" knowledge. Briefly activates when a chunk of memory is retrieved. Retrieve a memory based on aesthetic qualities. Prepare to move your body's left side. Skillfully draw realistic, free-hand illustrations. Attend to sensations on the left side of your body. The mirror image of C3 in some ways, but gets activated when we recall the most beautiful place we have ever visited. Home to fluid body motion and affect. This region is entirely nonverbal. Like F7, this region contains "mirror neurons." When we use this region, we focus on others' judgments regarding the appropriateness of our behavior. This region actively encourages us to change out behavior by providing feelings of embarrassment and possibly shame. Can also be activated when we wonder what others are thinking of us. Say the word "will"; as in what will occur in the future. Imagine yourself within a complex system. This region is highly future oriented and relational. unless F7, is not "as-if" oriented, but aids in serious predictions of what will occur in reality. Holistic and weighs many abstract spatial relationships at once. Entirely nonverbal, so offerings seem obvious or mysterious. Also activated when we consider symbolic meaning. This region is the seat of the physical sense of self in the environment. It helps us integrate visual and kinesthetic cues to guide how me move our bodies. The better this region works, the faster we integrate a multitude of visual and kinesthetic inputs in order to act with rapid precision. This region helps us grapple highly complex programs in a comprehensive, strategic way that simultaneously considers numerous risks, uncertainties, rewards and outcomes. Helps us weigh many pros and cons at once to arrive at intuitive solutions. Associated with skillful math performance. Visually disassemble an object to visualize its components and how it works. Visual how elements of an object will fit together to form a structure. People who rely on this region are natural engineers and architects, able to mentally rotate objects, follow charts and diagrams with ease, and project how building element will fit together in their mind's eye. This region can also compensate for or mimic deductive reasoning, by visualizing tree structures or Venn diagrams. Sense how colors, shapes, and other elements fit aesthetically. Gain an impression of a person's character from their appearance. Like O1, this region is incredibly visual. Unlike O1, it is imprecise and holistic. It concerns itself with visual themes: the various inter-relationships of elements that convey an image's overall balance and meaning. We may use this region to react quickly to a person or place, detect ugly or good design, or appreciate visual art. Fp1 Chief Judge: Focus on explaining, making decisions, noting errors, and screening out distracting information. Fp2 Process Manager: Focus on process, either step-by-step for tasks, or open ended creative brainstorming, or both. F7 Imaginative Mimic: Mirror others' behavior, pick up skills by observing others, and make imaginative inferences. F3 Deductive Analyst: Follow a chain of logical deductions and backtrack to correct thinking due to reasoning errors. F4 Expert Classifier: Accurately place concepts by testing them against many categories at once to find a best-fit. F8 Grounded Believer: Evaluate people and activities in terms of like or dislike, and/or recall details with high accuracy. T3 Precise Speaker: Focus on content of the spoken word, attend to proper grammar, usage, enunciation and diction. C3 Factual Storekeeper: Easily memorize and execute steps of movement (dance steps, etc. ), and/or recall facts. C4 Intuitive Listener: Focus on voice tone and other affective qualities of sound. Speak in a holistic way to influence. T4 Flowing Artist: Draw, paint, dance or otherwise use your body in a flowing, spontaneous, and/or artistic manner. T5 Sensitive Mediator: Attend to how others respond to you and later your behavior to get more desirable results. P3 Tactical Navigator: Integrate physical space, motion, and visual clues to move skillfully through the environment. P4 Strategic Gamer: Weigh many pros and cons, risks and uncertainties at once in order to finesse complex situations. T6 Purposeful Futurist: State what will surely happen in the future, and/or apply a symbolic meaning to a situation. O1 Visual Engineer: Mentally rotate, measure, arrange, assemble and explode objects with a focus on functionality. O2 Abstract Impressionist: Notice holistic themes, patterns, and relationships in photos, paintings, and similar images. Show a "tennis hop" brain pattern. Easily go "in the zone" in a crisis situation. Quickly integrate body and sensory information. Easily bored and need external stimulation. Focus on literal or common interpretations. Favor details that are dramatic or in motion. The "tennis hop" brain pattern is one in which all regions of neocortex out low amplitude and out of sync. This is an effective state that requires little energy while the shifting frequencies allow the brain to quickly direct whichever regions are needed for a surprise, incoming task. Brain activity reflects their background, training, and job expertise. Get "in the zone" when reviewing past events. Tend towards rote memorization, repetition, and in-depth reviews of daily events—all habits that help them burn new neural pathways. Good at recalling information without a context and recalling kinship data. Favor T5, which processes social feedback and T6, that helps us consider the future. So Si seems to lead to reinforcement and specialization over time. ISTJs and ISFJs are both visual (favor O1 and/or O2). ISxJs favor Fp2 over Fp1, while ESxJs do the opposite. Often show a "Christmas Tree" pattern. Find it difficult to get "in the zone," and can do so only after practicing and internalizing an activity over weeks, months, or years. Use regions that support imagination. A "Christmas Tree" pattern is one in which the neocortex is active all over, each region is of high amplitude and out-of-sync with others. This pattern indicates cross-contextual thinking. This pattern is also very energy intensive, and may produce distractions and contradictions. Show this pattern when they attack an unfamiliar, novel pattern. Their zen state works best when focusing on a single question, without distraction. Enter the zen state when ask to envision the future. Their whole-brain, zen-like pattern occurs when all regions of the neocortex are in sync and dominated by brain waves that are medium-low frequency and very high-amplitude. Other types only show this pattern when they engage in their specific area of expertise, unlike Ni-ers, who also show it when tackling a new problem. ENxJs usually benefit from a physical or sensory focus. NJs tend to be generalists compared to their SJs cousins. Show most efficient use of mental energy as they rely on evidence-based decision-making. Rely on T3, O1, C3 and Fp1. Tend to use other areas very little, even on tasks that would normally invoke them. Focus on goals and stimulated by task completion and error correction. Tend to move to action before accurate or what-if processing, so quick efficiency can become a pitfall. Show high activity in F8, which handles deeply felt personal values, often expressed negatively. Female Te types show more diverse brain activity and are more responsive to social feedback. IXTJs are more visual, attentive to tone of voice, and focus on implementation detail over quick decision-making. ESTJS attend more to details, are more open to brainstorming, and listen intently to authority figures. ENTJs can enter a creative mode similar to INTJs. Above regions are located away from direct sensory contact, so have a "deep" or "detached" quality. Tend to enter a dissociated state when arguing or meeting someone new. In this state, their neocortex shuts out raw emotions in order to enjoy objectivity. Engage the above regions + Fp1 and Fp2 when examining a topic from multiple angles and integrating the angles into a coherent way. INTPs are likely to quickly stop listening as they assess the relevance of what others are saying. Stimulated by communicating their explanations and decisions. Use Fp1 to suppress emotional impulses from deep in the brain in favor of sophisticated cognitive responses. Use Fp2 less, so may sometimes suddenly switch from highly composed to very angry. Use F5 a lot, which helps them adjust to social feedback. ExFJs show high activity in T3, but least activity in visual regions O1 and O2. ESFJs are more left-brained, high in C3 and F7. ENFJs are might right-brained, showing high activity in F4 and T4. Are consummate listeners who listen in a holistic way. INFPs can deeply listen for up to 10 minutes at a time, ISFPs listen briefly and then move to action. Show high activity in T3 and T4, which handle language. Carefully compose their own speech, attending to both content and delivery. Show high activity in F8, and are stimulated by rankings of importance. Show the least activity in interior regions that aid logic. Rely on left-brained (Fp1) decision making. INFPs may get to the core of a person's psychology by listening for so long. INFPs are less likely to defend their own views or take action, though when they stop listening, region Fp1 becomes very active as they make a strong (and perhaps final) decision. ISFPs are attentive when others withhold information (like social feedback). Se: Act quickly and smoothly to handle whatever comes up in the moment. Si: Review and practice in order to specialize and meet group needs. Ne: Perceive and play with patterns of relationships across contexts. Ni: Draw upon to whole brain to realize an answer to a novel problem. Te: Manager resources efficiently to quickly decide based on evidence. Ti: Reason multiple ways to objectively and accurately analyze problems. Fe: Evaluate and communicate values to enhance social relationships. Fi: Listen with your whole self to locate and support what's important. Overall, I found the book very interesting (including much of the material not summarized above). Perhaps the biggest takeaway for me was even though types did correlate to usage levels of various brain regions, one of the biggest surprises was how different types tended to use whole-brain states. Different types using different whole-brain techniques I found interesting. It's also fun to look at Nardio's summation of the function of the various brain regions, and compare oneself to the sample he gives of one's type (more on that later). Nardi did find that members of the same type tended to use the same brain regions (even separate from whole-brain states). Last edited by Seymour; 09-01-2011 at 03:48 PM. I do T4 a lot (in terms of dancing, yes but in the aesthetic memory/beauty thing like constantly) but tend to want to capture it in words...which would be T3, which is doubly strange since some people don't even really use T3 and T4 is totally non-verbal. That's pretty much the process of some of my creative writing, like I really, really want to capture moments, like "being there" in words. I would think this would be common in some poets and certain kinds of novelists as well as visual artistry or dancing. I'd be fascinated to learn more about this. Oh weird I missed the bottom part where it says Fi types use T3 and T4. Awesome sauce! I don't want to ruin it for anyone else. Amazing. I had no idea this was being researched! Haven't read it all through (yet...naturally I just went right to the Ti stuff), but I noticed that so far this does not appear to support Lennore Thomson's theory that Pi and Je functions (and therefore J types) are primarily "left-brained", and Ji and Pe functions (and therefore P types) are primarily "right-brained". Of the functions that seem to be associated with certain areas, it looks like they tend to be distributed on both sides. This is very cool..... I remember reading this perhaps in an earlier stage in another thread but I've lost where it is. I'd like to see where this goes and whether it really can link something so easily physically measurable to the individual weirdness that is personality preferences. Well, describing people as "left brain/right brain" is pretty crude. Nardi does include a weighted chart of an individual of each type (who is presumably fairly characteristic of his or her type). If you squint at those, you can kind of make a vague case that J's are, on the whole, more "left brain." In fact, it's very striking how "left brain" the ESTJ and ESFJ charts look, for example. Conversely, the FPs look the most "right brain" (if not as clearly as the ESxJs look "left brain"). The others are less clear. Fe looks left-brain-ish. Ni doesn't seem to have a clear pattern (even though T6 on the right sounds perfect for some aspects of Ni), and while F7 (left side) seems favored by Ne, plenty of other types favor it, too. Si seems a lot about specialization, so seems difficult to make a left/right brain call... although it does seem strongly associated with T5 (on the left). Se seems kind of all over the place (typical!). So, Thomson's characterizations (which were based on Niednagel's claim) seem sometimes correct-ish if you squint. Nardi does say that the Ni Zen-like state works best one problem at a time, while for Ne the Christmas tree pattern is all over the map producing associations. That makes the Thomson's left-brain/right-brain assignments understandable, since she was basing on Ni's "one problem at a time" nature, vs Ne's fire hose of associations. I think the most surprising and interesting part of Nardi's claims is the whole brain strategies that seem to be characteristic of various functions. So, for example, Te is not only about efficiency, but it helps quickly make decisions with a minimal amount of energy expended. Conversely, Ne not only produces all kinds of associations (right and wrong), it's also extremely energy intensive. Kind of brings a meta-dimension to the idea of brain specialization. Thanks for sharing this information, Seymour. I really like Nardi; he's doing some interesting things. Excellent write-up, as well. Did you do that all yourself? Show this pattern when they attack an unfamiliar, novel pattern problem. What was that from the non-Ni users about the whole Ni association with mysticism being a crock? Found this recent lecture given by Nardi at GoogleTalks. 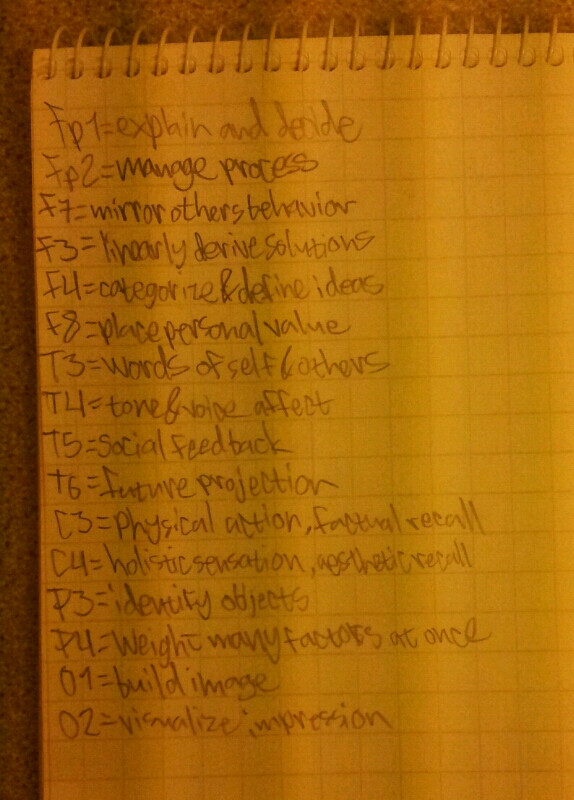 its pretty obvious how jungian functions place on these areas for the most part. some of the things in his study contradict common sense and some earlier smaller studies. like he doesent link f5 to Fe, wtf. i think he had too small study group or something, i mean 60 people and 16 types isnt all that much. What I posted is mostly quotes, Nardi's bullet points, misc. paraphrasing and some other notes. There's lots of other material in the book, so I hope people that are interested will buy it. That one cracked me up, too. It does explain a few work frustrations. [...]Found this recent lecture given by Nardi at GoogleTalks. Very cool! Thanks for posting that lecture. It's entirely possible that his pool was too small or skewed in some way... yet things that seem obvious are not always true. He does address the size of his study... I'll see if I can find the quote when I get home. I had similar expectations, though: that Fe would be uniquely associated with strong T5 usage, Ni with strong T6, Fi with F8, etc. Last edited by Seymour; 09-07-2011 at 07:48 PM.